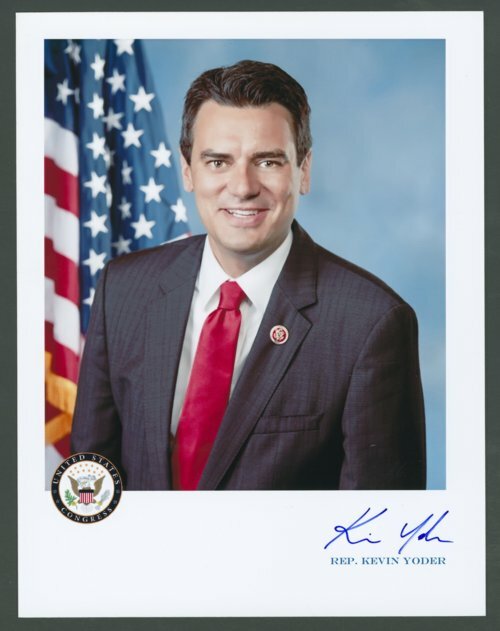 This is a photograph of Representative Kevin Wayne Yoder, who represents the 3rd Congressional District of Kansas. He grew up on a family grain and livestock farm in rural Kansas near Yoder, Kansas. He graduated from the University of Kansas where he received degrees in political science, English, and law. Yoder was elected to his first term in 2010 and was sworn in on January 5, 2011. As a freshman in the House of Representatives, he served on the House of Appropriations Committee. Yoder started his second term in January 2013, and returned to the House Appropriations Committee. Also, he serves as Vice Chairman of the Agriculture Subcommittee and sits on the State and Foreign Operations and Financial Services Subcommittees. Yoder and Brooke, his wife, live in Overland Park, Kansas.